We all know that personalization is a trend that never dies. People like giving their possessions individuality, and adding names or m onograms or a picture that has special significance is one way to do that. When it comes to mobile phones which, less face it, are pretty bland and boring right out of the box, the way to add individuality is with a personalized case. If you’re a company selling sublimation, this could be an entirely new market for you, provided you can get the blank product at the right price. Fortunately, EnMart is here to help you with that. 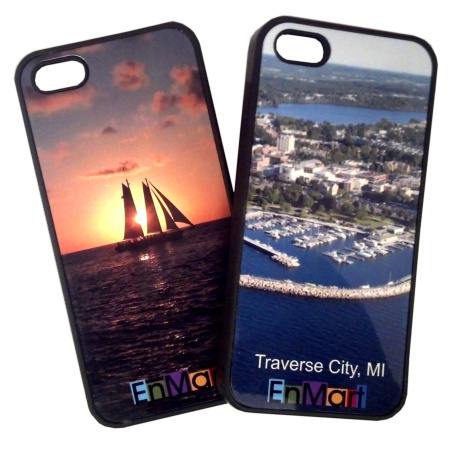 We are proud to offer rubber iPhone 5 cases for sublimation. Instead of being made of hard plastic, like most cases, these iPhone 5 sublimation cases are made of durable, flexible black rubber that is comfortable to hold. These cases are also anti-micobial. They also have pre-applied adhesive with an easy to remove backing paper, and come with one high quality gloss white sublimation metal insert. Instructions for pressing and a template for creating artwork are available on our website. The cases are for the iPhone 5, but may be compatible with other phones as well. If you would like a test sample, please contact us. We would be happy to provide a sample upon request.